A Sunday or two ago, as I paged lazily through an issue of Food & Wine Magazine, I zeroed in on a feature that included recipes from all around the world that pair wonderfully with vino. But I ask you, is there really a food that doesn't? 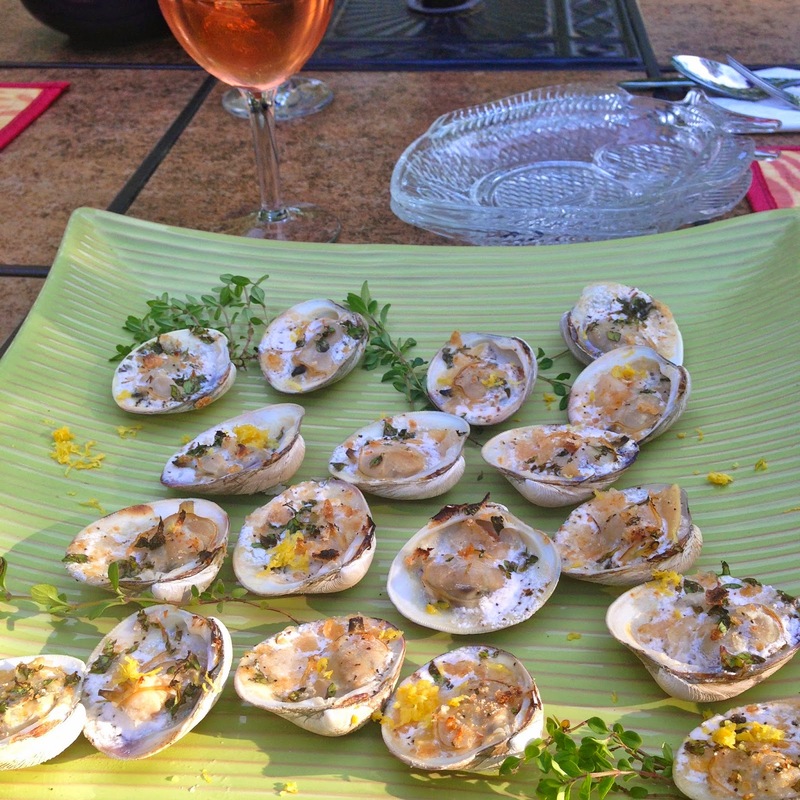 While we only had a beautifully dry Rose on hand, I decided to try these simple and bright broiled Clams that were instead recommended for pairing with Sauvignon Blanc. Clams are a favorite around our house, and this easy appetizer immediately captured me and seemed perfect for our special night in. That said, it would also be a fantastic way to kick off an elegant dinner party or even wine tasting get-together. 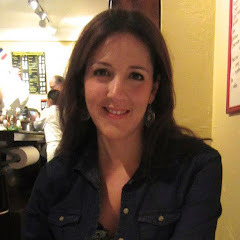 As for the actual "magazine-endorsed" pairing, F&W recommends "a citrusy Chilean Sauvignon Blanc, like Casa Marin's 2011 Cipreses Vineyard or 2012 Matetic EQ." The results were lovely and this recipe is both easy to execute and quite tasty. Enjoy!! 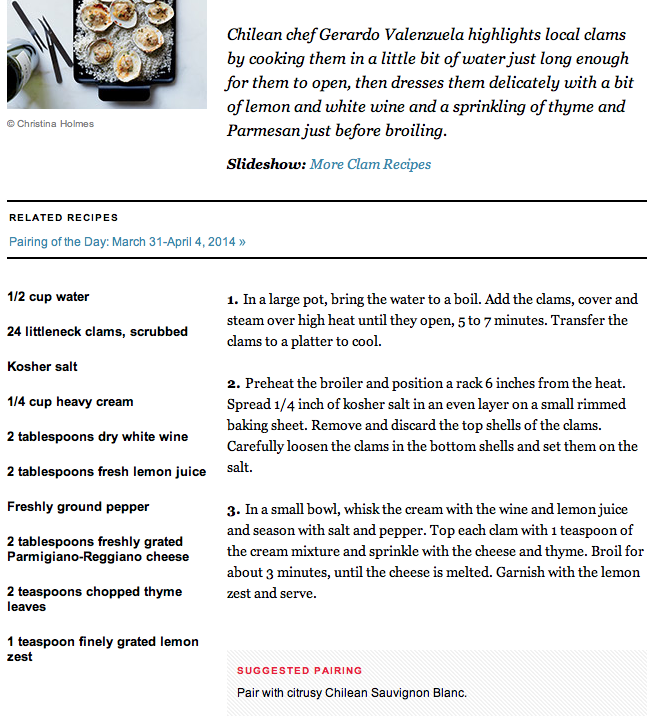 Now for the recipe, directly from Food & Wine. so well with sweet stone fruit; the combo is really surprising and makes for a very complex yet subtle flavor profile. I created today's speedy Sorbet recipe quite by accident. I had some leftover Mint leaves from our recent Gnocchi with Peas & Spring Herbs that I didn't want to waste. 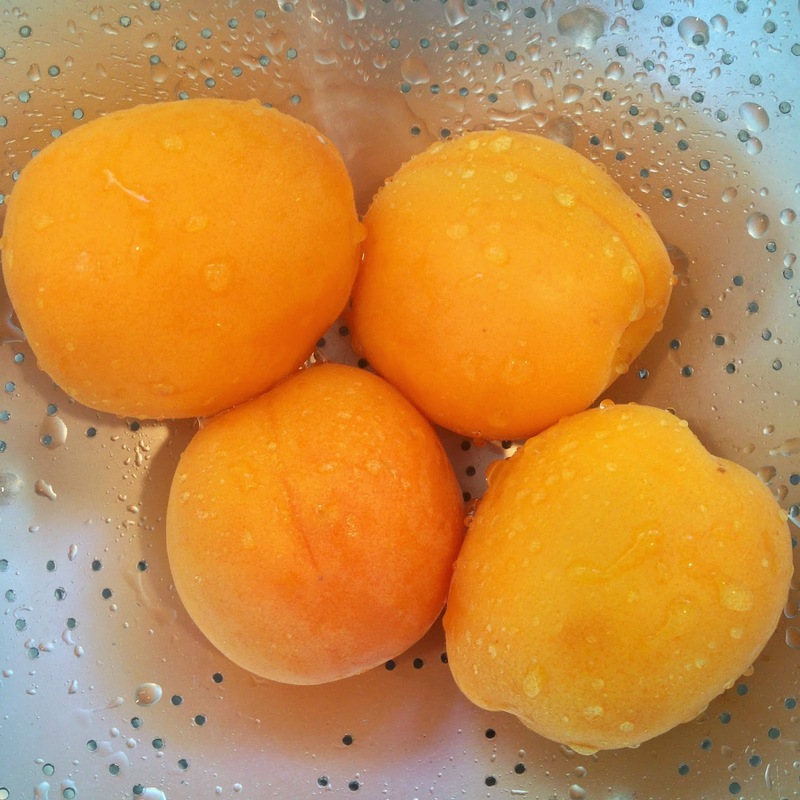 Then a week or so later, my bunch of Apricots I'd been looking forward to eating were ripening at a faster pace than I could enjoy them. Whenever fruits and herbs are at their peak, it's a great idea to freeze them in order to minimize waste. So I pitted and sliced up my Apricots, and weeks before that, to preserve my mint, I had placed three or four leaves in the bottom of each compartment of an ice tray before covering with water. Fast forward to the present day, and in rummaging through my freezer, the thought occurred to me that these two ingredients might just work wonderfully together. Mint Ice Cubes make a fun addition to summer drinks, and in this case they provide a great way to add both ice and Mint to your blended creations. To recap: Make Mint Ice Cubes using 3 or 4 leaves of Mint in each ice cube compartment, cover with water and freeze! ~Blend in a high powered blender until very smooth, scoop out, and serve immediately! So much of my weekly menu-making is dictated by what looks fresh and in season at the market. When I am not ordering the heck out of the great produce often available at Freshdirect.com, I am perusing the aisles at specialty stores and, when I can, farm stands. Nothing brings me inspiration faster than grabbing a good lookin' ingredient and building a menu around it. Entire food movements swing on this very basic principle, and you don't need to be a serious home cook to benefit from using it yourself. Next time you have the urge to create something in the kitchen, try starting with whatever item calls to you, and build and research what you'll do with it from there. With the internet at all of our fingertips, there's never been an easier time to get creative. 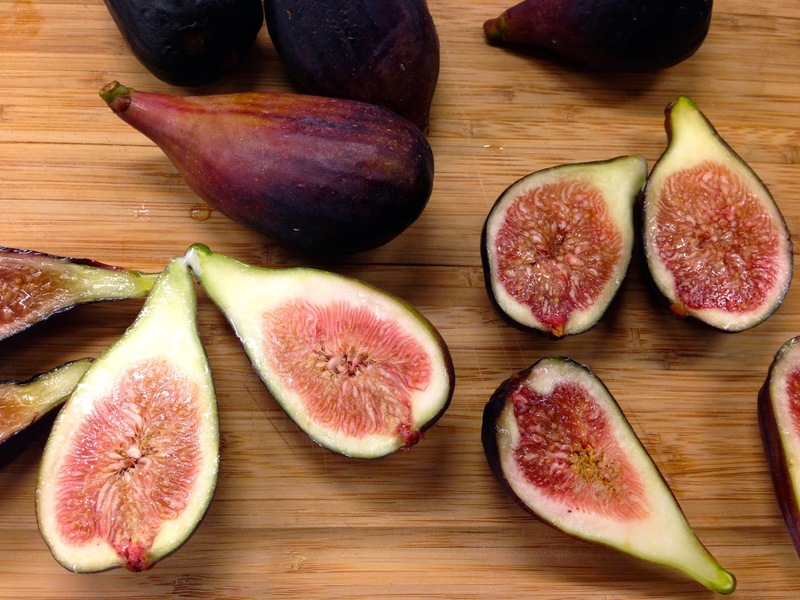 Today's ingredient muse is in-season Figs, just now appearing on the scene at stores everywhere. The world of figs is a wide one, but we'll be using the well known Mission Fig variety. With these beauties ready for prime time, I decided I'd turn them into a very simple yet flavorful salad using just a few ingredients. Peppery Arugula would be a great foil for the sweetness of the Figs. A mellow mix of Balsamic Vinegar,Olive Oil, and a bit of Dijon Mustard serves both as a marinade for the Figs and a light dressing to tie the greens together. Shaved Parmgiana curls provide the salty counterpoint. Let your figs sit for thirty minutes in the marinade, and from there, this 4-ingredient salad makes itself. Dress it just before serving and enjoy (and never forget to let the season inspire you!). 1. Combine the first 6 ingredients in a medium bowl and mix well. Add the Figs, gently stir, and allow the Figs to sit in the Marinade 30 Minutes. 2. In another bowl, combine the Arugula with the sliced Red Onion. When Marinating has finished, spoon out a 2 to 3 Tablespoons of the Marinade onto the Arugula. Toss slowly and add additional dressing as needed, taking care not to overdress salad and make it soggy. 3. To serve, plate the arugula down the middle of each bowl. Place 4 of the marinated figs on each portion or to the side of it. Finish with shavings of Parmigiana cheese and some extra Black Pepper. Serve immediately. Ever walk by an Italian restaurant or pizza place and pause a moment to smell the intoxicating aroma of warm garlic? I sure have, and if you ask me, there's nothing really like it. Where garlic is concerned, the more the better - and who cares about garlic breath, anyway? I consider it a bonus. That's why when I was recently jonesing to put together a quick tapa as an al fresco appetizer (summer is here! ), I stopped right at this drool-worthy Garlic and Shrimp combination: Gambas al Ajillo or Shrimp with Garlic, Spanish style. Gambas al Ajillo can be found all over Spain and really anywhere where tapas are served. It doesn't get more classic than this garlicky to the max dish. And when you see how fast this delicious tapa comes together, you'll be completely smitten. It is almost too easy. And the taste, oh the taste - just luscious. A nice kick of spice from the Crushed Red Pepper and smoky complexity from Spanish Paprika - one of my favorite spices that is also responsible for the striking reddish color of the shrimp sauce, make an amazing flavor combo. Be certain to buy yourself a nice loaf of rustic peasant bread to soak up the garlicky oil goodness at the bottom of the bowl. Now sit yourself down with a a nice dry white or rose and enjoy the king of all tapas. You will not be disappointed! Note: this is a fast cooking recipe so be sure to have all your ingredients measured and ready to roll before you start. 1. Heat Oil over a medium flame for a minute and add the minced Garlic and Crushed Red Pepper. Stir gently for about 2 minutes, taking care that the Garlic doesn't burn. The mixture will become fragrant. 2. 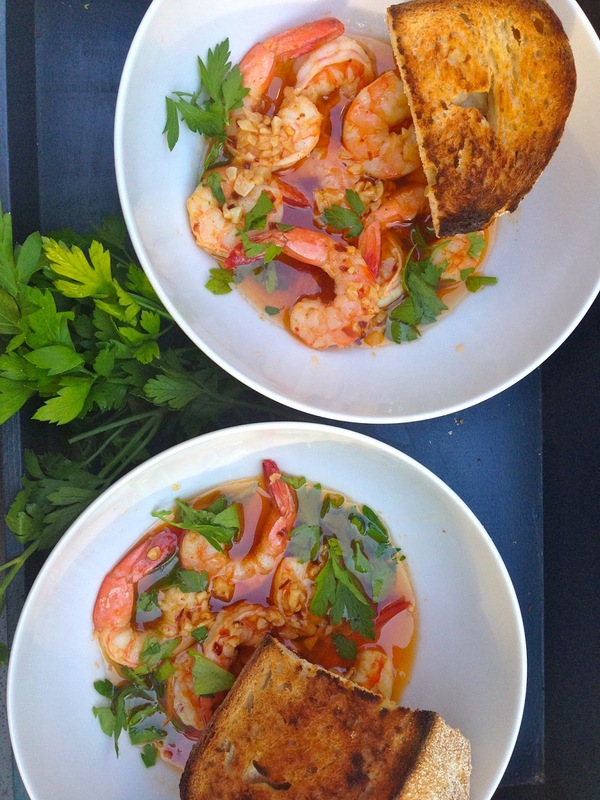 When the Garlic becomes just slightly brown, add the Shrimp, Lemon Juice, Cognac (or substitute) and Paprika. Raise the flame to high and stir constantly until the Shrimp become pink and curl up. About 2 more minutes. 3. Season the mixture with one or two healthy pinches of Salt, and ample Black Pepper. To Serve: Plate equal portions on Shrimp into individual bowls and add some of the Garlic and Oil Mixture on top. Sprinkle each bowl with chopped Parsley and serve with a generous wedge of crusty toasted Bread.